Rosy Outlook: Printed Summer Pants + Fashion Frenzy Link-Up! Printed Summer Pants + Fashion Frenzy Link-Up! Happy Hump Day y'all! Hope you're having a wonderful week so far. Monday and Tuesday were definitely very hectic after being off work for 2 weeks. That is the longest I have taken time off in my adult professional career! It was fabulous though! I'm still trying to get back into the swing of things especially getting back on the blogging and social media game. It was nice to take a little break and only post fun wedding photos for a while but I'm also happy to be back! These pants are my latest obsession! I wore them multiple times while at the beach and also wore them when I went out for drinks before our rehearsal dinner with the bridal party. The slits on the side are SO cute and they're incredibly comfortable. I think all summer I'm going to be living in flowy pants like these. I love that you are wearing a hat with this!! And those pants are amazing! What cool pants! You look beautiful as can be! Seriously so in love with these pants! Youa re so so cute! And I seriously forgot to congratulate you on the wedding! I saw the photos from insta! You are so so gorgoeus! Congrats! So in love with your hat and those pants! Coming back to work is the absolute worst after vacay, hope it gets better for you!!! This is the perfect beach outfit! Those pants are so cute and they look super comfy! What a beautiful look! I can't believe those are pants! I would have thought it was a maxi skirt. What cute pants! I love the print and how you styled them with the tank. I definitely thought it was a maxi skirt at first glance! Hope the week is getting less hectic. It's always so hard being gone from work, but so worth it! You look so cute! Those pants are perfect for the beach. It's always the worst coming back to work after vacation. I am loving your Sunshine Hat. Gorgeous look you have created. How cute are these pants? They look so comfortable and I love your breezy beach shots! Wow absolutely gorgeous photos Kelly! Hope you are having a great day! I love printed pants, but have yet to find a pair I like. These look so good on you! Such a cute outfit! You look fabulous! I'm in love with the outfit!! So stylish! Cute look. Love the photography. Cute beach outfit! Love those pants - they look so comfy! 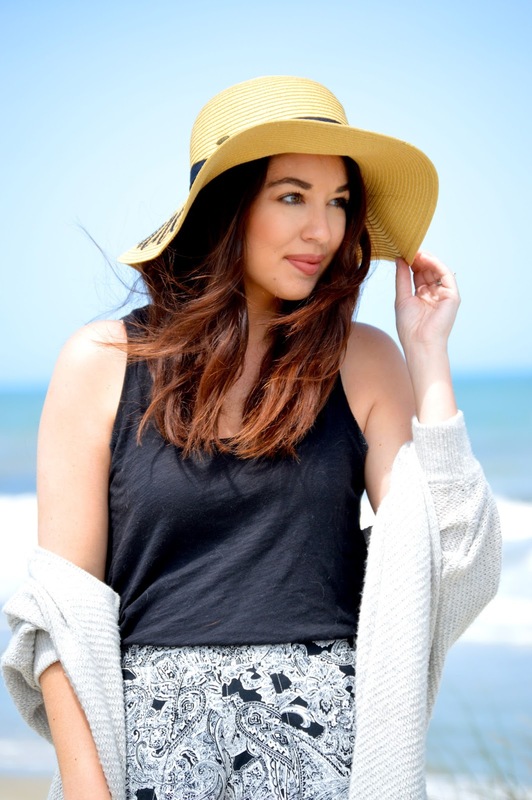 This is the most perfect beach look! The photos are so pretty too! 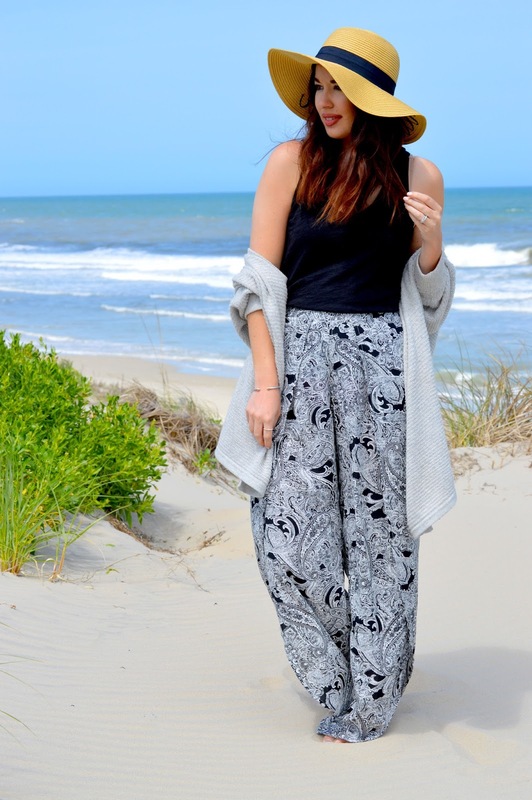 I love these trousers- so fun and perfect for the beach! LOVE these pants! Such a beautiful look and stunning photos! You so make me want to go out and buy a pair of pants like these! Such a perfect beach look! These photos look amazing, girlie! I so wish I was at the beach right about now, lol! 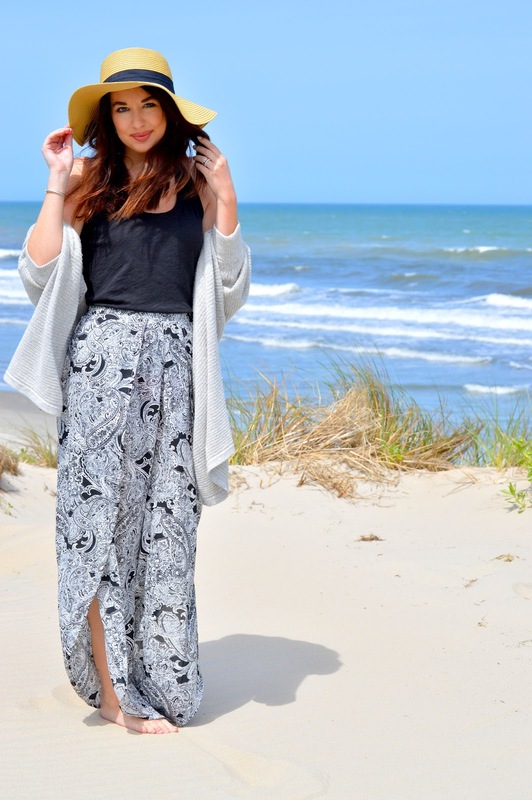 I love your pants, they look so comfy and perfect for lounging on the beach or boardwalk! Thanks so much for sharing and I hope you're having a great week so far! Such a fun print! I love that hat, too! Love this beachside shoot! You look gorgeous, Kelly! I love those flowing pants and your gorgeous sunhat!